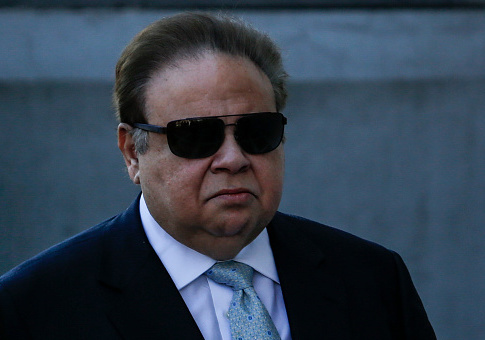 Florida eye doctor Salomon Melgen, who garnered public attention as Sen. Bob Menendez's (D., N.J.) co-defendant on separate corruption charges, was sentenced to 17 years in prison for Medicare fraud. Melgen was convicted last April of defrauding Medicare of $73 million, and on Thursday, U.S. District Judge Kenneth A. Marra handed down his sentence, the Philadelphia Inquirer reported. Melgen will also have to pay $42.6 million in restitution to Medicare. Melgen became the highest-paid Medicare doctor in the country by having patients undergo unnecessary operations, which some compared to torture. The 67 crimes Melgen was convicted of included health care fraud, falsifying records, and submitting false claims. The wealthy physician gave patients eye injections and retinal laser blasts that were not necessary. He also billed Medicare for a variety of illegitimate operations, including treatment on the fake eyes of one-eyed patients. Separately, federal prosecutors tried Melgen along with Menendez for corruption last year, which resulted in a mistrial in November owing to the hung jury. The prosecution’s case used the private flights, European vacations, and other gifts Menendez received from Melgen as evidence of bribery, arguing that Menendez interceded on Melgen’s behalf with Medicare officials. Menendez was such a frequent user of Melgen's jet that the pilot, according to testimony, kept Menendez's favorite brand of water, Evian, on the plane. Menendez’s defense argued that the senator was simply good friends with Melgen and the gifts and flights he received were part of their years-long friendship. The pair first met because after Melgen was appointed to a state board in Florida, he became politically active and hosted Democratic fundraisers in his home. Prosecutors took steps to retry the two men after the mistrial, but in January, they decided to drop the charges. Menendez declared himself vindicated after the mistrial and after the Department of Justice's decision not to continue with charges. This entry was posted in Issues and tagged Bob Menendez, Crime, Democratic Party, Salomon Melgen. Bookmark the permalink.